Mon Ami Gabi is one of the most popular restaurants on the Vegas strip. With a prime central Strip location at the Paris, a gorgeous outdoor patio overlooking all the action, and a wonderful French menu, this really comes at no surprise. For quality French food, terrific service, wonderful espresso, and prime people watching, be sure to give Mon Ami Gabi a shot on your next Vegas trip. The food at Mon Ami Gabi is just as fabulous as the ambiance. Be prepared for a long wait, as they take no reservations for the patio, which happens to be one of the busiest places on The Strip. Don't worry, the food is well worth it in the end! Value wise, breakfast and brunch are the best times to visit, and in my opinion, also the the best time weather-wise. Both the breakfast and brunch menus include a variety of traditional French favorites. The breakfast menu is a bit more extensive and includes omelets, delicious crepes and waffles, and skinny crepe pancakes. But you must hurry as breakfast is only served from 7-10am. If you can drag yourself up this early in Vegas, this is by far the best time to visit! Their house blend coffee (Intellegista) and espresso are both wonderful and include free refills, so you can linger around and enjoy the views even longer. The brunch menu is a bit more limited in terms of breakfast options, although they do still offer Eggs Benedict, as well as a delicious Quiche. A wider variety of lunch plates make up the majority of the menu. For a light lunch, I highly recommend the Warm Chicken and Brie sandwich. For vegetarians, your choices are pretty limited, although staff is willing to accommodate. The Avocado Toast (hard boiled eggs, french green beans, and Caesar dressing) is your best bet - very delicious and filling. Sandwiches are served with delicious homemade fries. The lunch and dinner menus are far pricier, however, they offer a more diverse range of appetizers and entrees, including many great seafood selections. Other hot picks include Croque Monsieur, the Maine Lobster Roll, the Seafood Crepe, and the Macaroni Gratin. If you are are up for something really special, treat yourself to the Chilled Seafood Platter. For 60 bucks, you will get to feast on whole Maine lobster, jumbo shrimp, oysters, and salmon tartare (served with cocktail sauce, mignonette, gribiche, lemon and baguette chips). Another treat to consider is the Charcuterie & Cheese platter (dinner only), which includes homemade charcuterie, rosette de lyon saucisson, olives, cornichons & mustards, a sampling of three cheeses, dried fruits, grapes & nuts. The dessert menu is really tempting with classic profiteroles, salted chocolate caramel tarte, and chocolate mouse amongst the more enticing selections. And of course, a full menu of espresso drinks is available to compliment your selection. Service at Mon Ami Gabi is terrific, with waiters being extra professional and attentive. 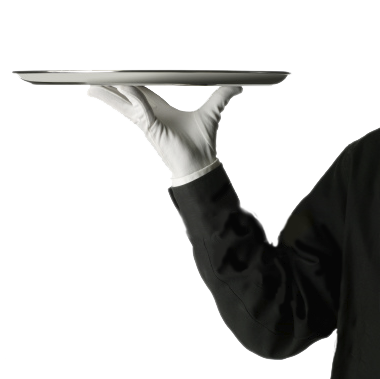 Waiters consistently check to see if you need anything and are quick to refill coffee and clear plates. The ambiance at Mon Ami Gabi is what really setts this restaurant apart from most others on The Strip. Centrally located in the Paris Hotel, the views are great from every direction. Be sure to wait for a seat on the gorgeous patio, which includes plenty of shade, even for those brutally hot Vegas summer afternoons. The setting outside is so leisurely and relaxed. If you get a really good seat, you'll have a prime view of the wonderful Bellagio fountain show. The pace is really slow, so do not come here if you are in a hurry! Enjoy unlimited coffee as you gaze out unto all The Strip action. Mon Ami Gabi is hands down the best choice for a delicious and relaxing brunch on The Strip! Everything about Mon Ami Gabi is excellent, from the beautiful Strip setting, to the service, to the food and coffee. It's one of my favorite places for a relaxing brunch date on The Strip. Really, you cannot go wrong here if you like exquisite French food and breezy outdoor dining.